Most Entertaining Fight of Brands as Careem and Pepsi Pakistan!!! Pepsi Pakistan and Careem Pakistan are two famous companies that are providing many services to its customers. There are lot of products by the Pepsi that many people of the Pakistan used. On the other hand, Careem also provides the best journey services on low rates with much safety. 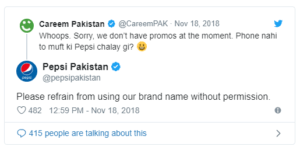 Today, both companies have come face to face as Careem replied on Twitter as you can get a free Pepsi and Pepsi Pakistan take it serious. The issue is not so big but Pepsi became more serious on this matter and many tweets were done by both companies via Twitter accounts. A vast fight has been occurred between both companies and people are tweeting that KFC and Coca Cola should also be involved in this fight. Many people are saying that Pepsi has taken it to next level. All the tweets of fight between Careem and Pepsi are given below, check these details and know about the great fight between both companies. The Pepsi Pakistan tweeted please refrain from tweeting at us, guys and girls. Then Careem also tweeted on a funny mood as wow a bit too sensitive. After this, Pepsi also replied as don’t use our brand name without our permission. On this tweet Careem Pakistan again replied in a funny mode that whoops, sorry we don’t have promos at the moment. If there is no Phone then a free Pepsi would be ok. This was not a serious matter at all but Pepsi take it serious and this fight came across among all the public. People also commenting on this issue as Coca Cola and KFC should also be included in this great fight. People want new and ridiculous news so they want to see KFC and Coca Cola too in this fight of the brands. Now the comments has been stopped but it may be started again by the people if anyone tweeted again.